immunoassay device for the qualitative simultaneous detection of multiple drugs. 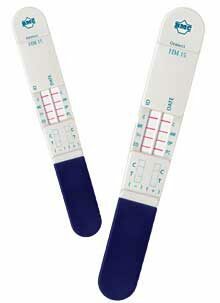 Oratect XP PM19 introduces a blue line indicator for the sufficient collection of saliva. The presence or absence of a red line corresponding to a specific drug on the panel indicates a negative result or presumptive positive result respectively. This on-site saliva screen allows testers to obtain the rapid results they need without having the concerns of handling a urine specimen.